Before we get into any details, one thing should be made clear – the only true answer to the question “Is it possible to run Exchange 2003 and Exchange 2013 in the same domain” is “no”. Coexistence between Exchange 2003 and Exchange 2013 is flat out impossible – no “buts” or “howevers”, and neither are there any workarounds or patches. But this leaves us with a new question: what are the closest alternatives? 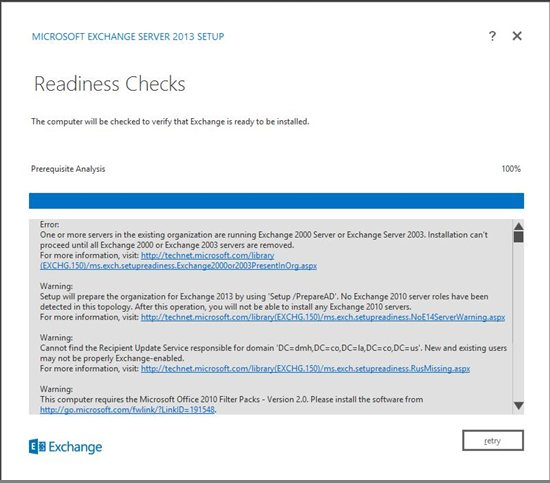 If you’ve ever tried to install Exchange 2013 in a forest, which contains servers running Exchange 2003, you already know that in this scenario the Readiness Checks tool always returns an error (like the one on the image below) and does not give you an option to proceed. Any further attempts to run Exchange 2003 and 2013 in one domain will just leave you ending up in the same blind alley. See this TechNet post for more. You have to migrate to Exchange 2013 somehow, though. So what’s next? The most often suggested upgrade path, given that doing in-place upgrades to Exchange 2010 and then to Exchange 2013 is not supported. The main advantages of this method are that you can do it within your existing domain, and with little or no impact on end-users. The latter is achieved thanks to the possibility of maintaining coexistence Exchange 2003 – Exchange 2010 and Exchange 2010 – Exchange 2013 deployments. The downside is that, unless you had Exchange 2003 running on a high-end server, you will most likely have to purchase separate boxes for the Exchange 2010 and Exchange 2013 installations. Additional considerations: purchasing a throwaway upgrade to Exchange 2010 and installation of all Exchange 2010 service packs. Rewrite all MX records to point to the Exchange 2013 domain. Make sure to also direct all other services and appliances (e.g. firewall gate) to the new machine’s IP address.